Here on the fourth floor, we love our yoga. What we don’t love is fellow yoga-goers who don’t respect the peace, tranquility and silence (!) of the space. As much as we learn to focus internally, have a clear mind and not succumb to distractions – when the person behind you rips up their mat or casually walks out for a bathroom break, it really grinds our gears. Having dabbled in moksha, ashtanga, hatha, yin and a myriad of other practices (you might call us ‘yoga tourists’ – we’re still settling on studios and types of yoga), we compiled a pretty robust list of yoga pet peeves from our combined years of experience. We’re sharing this so hopefully others will practice good karma and respect the space and people around them. We think this applies to many aspects of life, but (for the purpose of this post) especially yoga. When you’re attempting to listen to your instructor speak and someone awkwardly steps over you, then asks you to move your mat so they can fit? Worst. Show up early, get settled in and help make the class enjoyable for everyone. If you don’t have enough time to stay for final shavasana, (in our opinion, one of most important parts of your practice) then take your towel, water and tip toe out of the room. Here’s what always gets us – LEAVE YOUR MAT. Ripping your mat off the floor and running out is distracting to your fellow yogis and a little rude to your instructor – especially when you take off as they’re still talking. Leave your mat, then come back and get it after you’ve changed. Before the instructor walks in is not a time to chat with your friends about your day or the cute guy in the class (tempting, we know) – save it for the change room. This is the time when you’re trying to get in the zone and perhaps practice a little self-meditation, while prepping yourself for the class ahead. So, shhh. – Bathroom breaks are distracting. Double the annoyance if someone walks out while you’re trying to hold dancers pose. You know how long the class is, plan accordingly. It’s way easier to hold pigeon when people aren’t accidentally bumping you. 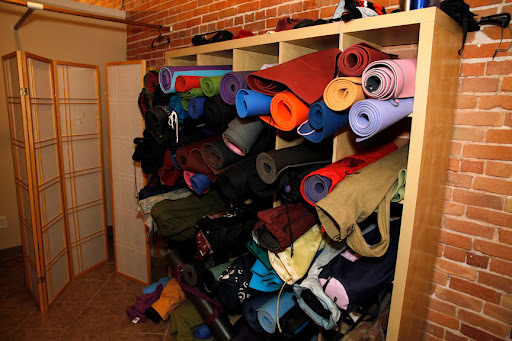 We hate when yoga studios have a ‘towel policy in effect.’ This policy is supposedly to guard against slipping. Not everyone sweats a lot (even in hot yoga) and it’s annoying that we either have to carry a towel, a yoga mat, wallet and a change of clothes, etc. or rent one for $2. If you’re feeling like a sardine, you’re probably not giving 100% to your practice. We think there shouldn’t be more than 20 people to one instructor. Otherwise, they’re not able to watch everyone carefully enough and yoga can be dangerous, yo. 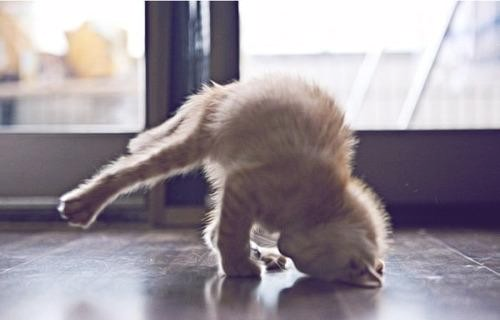 Especially if you’re trying to pull off some more advanced moves or attempt a handstand. That’s a lot of OM. While we’ve been making our rounds of the city’s yoga studios, we’ve noticed that there’s one thing in common to all: tiny, cramped change rooms. To make matters worse, classes start and end back-to-back, so everyone is cramming into the room at the same time. If studios can’t expand their room sizes, we’d suggest posting the following sign “Dear fellow Yogis, please respect the following rule when in our tiny change-room: THE NAKED GUY/GIRL ALWAYS GETS THE RIGHT OF WAY. Thank-you, management”. That should help solve those awkward brush-bys. Older men that wear too short shorts. Distracting, and not in a good way. Deep breathers! There’s always one person who goes too far with the yoga breathing and it’s really distracting. Farts. Obviously. It might be the only good reason to excuse yourself from a class. Cell phones. TURN IT OFF BEFORE YOU COME IN.